We have a new trailer for you! Eros International and acclaimed filmmaker, Aanand L Rai have joined hands with Drishyam Films for a black comedy, Newton. About a rookie government clerk, assigned to conduct elections in conflict-ridden jungles of Chhattisgarh, despite the fear of Naxalite attacks, the film highlights the predicament of an idealistic youth against the world’s pragmatism and cynicism. Moved by the difference in the Indian Constitution’s preamble and the reality of our times, director, Amit V. Masurkar, envisioned the highly anticipated film and penned this comedy-drama’s story. Essaying the titular role, National Award-winner, Rajkummar Rao, currently high on the successes of Aligarh, Trapped and Bareilly Ki Barfi, is brilliant in a never-seen-before avatar. With other performance-oriented actors such as Pankaj Tripathi, Anjali Patil and Raghubir Yadav, the political satire has premiered in a number of international film festivals including, Berlinale 2017, Edinburgh International Film Festival, London Indian Film Festival and Tribeca Film Festival and received rave reviews. Shot in the mining town of Dalli Rajhara on the outskirts of Maoists controlled forests; the movie is set to present an eye-opener to the viewers. 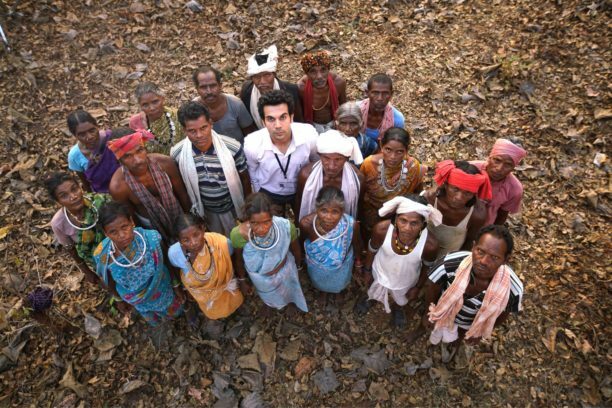 To conserve the rawness of the film, tribals from the jungle settlements were auditioned and finalized by the casting director in a month’s span.